The EU’s foundational values democracy, human rights and rule of law are shared by the Member States and rooted in their constitutional traditions. Constitutional pluralism recognises the legitimacy of parallel legal systems. Pluralism however cannot provide answers when it comes to the design and enforcement of foundational values, which require homogeneous acceptance throughout the Union. Deficiencies affect the entire Union legal order. The argument of national identity in Art. 4(2) TEU must not be construed as a means to undermine the application of the law, but is an EU-law internal counterbalancing instrument. This is of relevance because, when addressing systemic deficiencies, the enforcement under Art. 7 TEU may interfere with effectively internal matters of Member States. In order to protect common values the EU has to avail itself of safeguarding competences under Union law, even in areas outside of application of EU law stricto sensu (the acquis). Using the example of the rule of law, it can be demonstrated that value protection is a predominantly political task that calls for political solutions together with effective rule of law dialogues, and needs EU institutions to act as facilitators and guardians of the treaties by making use of the enforcement instruments under Art. 7 TEU and Art. 258 TFEU. In parallel, a culture of values could be fostered by an evidence-based monitoring within a new instrument of “CVM for all” (Cooperation and Verification Mechanism). The European Union is founded on values. Value foundation can be understood both as the basis for and the corollary of a normative integration process. This is mostly visible in the area of fundamental rights, shaped over decades by the jurisprudence of the Court of Justice of the European Union (CJEU) and codified in 2003 in the European Charter of Fundamental Rights. It went hand in hand with a European constitution building characterised in CJEU case law as the “autonomy” of the EU legal order in relation to the national constitutions of the Member States and to international1 legal systems. Both the autonomy of the EU legal order as well as certain values contained in Art. 2 TEU have been tested by what is known as “rule of law crisis” over the last years. Some Member States have experienced an intentional, governmental-driven weakening of the independence of their judiciary, and a set-back in the realisation of fundamental rights of freedom of the press and other civic rights. For the first time in the European integration process, elected governments have even openly repudiated the principle of legality as such. In 2017, the Commission initiated the first phase of the enforcement procedure under Art. 7 TEU, against Poland. Subsequent to the Sargentini Report, the European Parliament2 started the first phase of such ‘value enforcement’ against Hungary in September 2018. In the context of this dispute, it appears that legal notions like the sovereignty of nation states, constitutional identity and democracy in a pluralistic perception of constitutions within the EU were instrumentalised to justify a detrimental development that is to be critically apostrophized as the “backsliding”3 of states.4 Another sugarcoating term used was the self-identity of the constitution and the reference to the “historical constitution”.5 It seems therefore appropriate to put these terms into their context of interlinked values of Art. 2 TEU. The present paper aims at relating the discussion about value content and enforcement with their legal functions as driving forces of a European constitutionalisation process: the nature of values and foundational principles of EU law, how values are interlinked amongst each other, and to what extent the Union legal order requires value homogeneity as a gravity centre of legal integration. This normative analysis and particularly the requirements of a pluralistic, value-based constitutionalism shall be tested against the practical recent challenges to the rule of law assessment and enforcement of the rule of law: on the crucial aspects of the principle, how situations are monitored and assessed and how individual and systemic infringements of the rule of law can be addressed. It is submitted that—for legal reasons—an “enforcement” of values can only be a political process, yet guided by legal (procedural) side rails. Values require and deserve transposition into justiciable norms or principles as part of a legal discourse and political-societal choice. The undeniable existence of constitutional pluralism within the EU is to be counter-balanced by a concept of homogeneity that protects its core constitutional values as a matter of shared and embedded sovereignty. Arguments of “national identity” under Art. 4(2) TEU have to play an intrinsic Union law role. All branches of government within the EU not only must acknowledge the autonomy of the EU legal order, but have to assume their responsibilities in actively protecting and promoting the foundational common values. This could show the way forward from focussing too much on “enforcement” when addressing values, while nothing less than their full realisation is necessitated. “Union is founded on the values of respect for human dignity, freedom, democracy, equality, the rule of law and respect for human rights, including the rights of persons belonging to minorities”, and that these “values are common to the Member States in a society in which pluralism, non-discrimination, tolerance, justice, solidarity and equality between women and men prevail”. The vivid discussion about the rule of law crises in some member states over the last years was shattered by uncertainty about the content (‘design’) of values in EU law, particularly on the rule of law, and of means to enforce it. It would be short-sighted to tackle these crises and backsliding of democracies (e.g. the continuous dismantling of an independent justice system in Poland and Hungary) only as enforcement problems. Many questions relating to the realisation of foundational values and principles point to the constitutional architecture of the Union legal order, particularly to the relationship between values, principles, norms and procedures. The wording of Art. 2 TEU does not require that the values are binding in law, but only that the Union is founded on these values and that they are common to the Member States. Yet the normativity of values will depend on the extent at which their compliance can be enforced. Any acceding state will have to abide by the same values as required by the Copenhagen criteria and crystallised in Art. 49 TEU.14 It is expected to continue to abide by them after having turned into a Member State. Further, the enforcement mechanism in Art. 7 TEU makes clear that not any breach of law, but only a systemic breach of the values can trigger the enforcement consequences. Uncertainty as to the nature and content (“design”) of the values of Art. 2 TEU has consequences for their enforcement. This was aggravated by an acquired lack of competences labelled as the “Copenhagen Dilemma”, referring to the fact that rule of law compliance of candidate countries was monitored and sanctioned before the moment of accession, but not after turning them into Member States. However, firstly, the readiness for accession of certain candidate countries to the EU as defined by the Copenhagen criteria had obviously not been taken very seriously when the conclusion of the negotiations approached. Secondly, even now, years after their accession, the content of the values whose enforcement is endeavoured is still not accurately enough defined as to enforce compliance by effective sanction mechanisms. Both together made the image of a “dilemma” less convincing. Common values are building legitimacy for the EU and justify the endowment and exercise of competences and transferred powers. The values mentioned in Art. 2 TEU are on one hand intertwined by their content, because a realisation of democracy and fundamental rights without applying the rule of law does not seem to be possible. On the other hand, values are intertwined institutionally, because they are shared amongst the Member States and the Union. The content of constitutional values is to be defined by a legal substantial cooperation amongst constitutional courts and courts exercising constitutional function15 within the European Union, may it be by preliminary references under Art. 267 TFEU for harmonised precedence jurisdiction through the CJEU, or by other, more informal references and influences of legal developments across Member States. Decisions of national courts are the basis for the ECtHR to state a socalled “European Consensus”16 in its case law, which the court uses to justify a case-driven development in the interpretation of the ECHR, whereas the CJEU avails itself of the method of comparative analysis17 when interpretatively developing its case law. The constitutional Europeanisation process is characterised by the cooperation of courts and a comparative establishment of the law in mutually “interlocking”18 legal orders. Albeit there is no full integration of the three orders (EU primary law, constitutional traditions common to the Member States and ECHR), it can be acknowledged that there is a singular constitutional connection established amongst them, namely by Art. 6(3) TEU. Yet, despite the assertions of a case driven process of constitutionalisation, the value sphere of EU law is specific: while the CJEU might have opportunities to state on aspects related to values, one cannot expect the CJEU to conclusively determine the full content of “EU values” in its jurisprudence on value enforcement by way of Art. 7 TEU, because in the present constitutional architecture the CJEU does not have jurisdiction to rule on the substance of values, but—in accordance with Art. 269 TFEU—would only rule on procedural aspects of enforcement. In this limited enforcement setting, the CJEU will not be able to assume its ultimate functions as EU constitutional court, but will have to cede the final determination of risks, systemic deficiencies and sanctions to the political institutions Council and European Council. This legal circumstance is a starting point for the argument that value enforcement is accomplished in the political sphere. The protection of the substantial core of the values democracy, rule of law and human rights is a matter of common endeavour and any systemic deficiency of these values in one Member State poses a challenge for the EU as a whole. Legislative competences for policies and law-making powers are attributed to the EU in the various domains as exclusive and shared competences (Art. 3 and 4 TFEU). Also the scope of application of the Charter of EU fundamental rights, brought about by Art. 51(1) Charter, is limited to areas of implementation of Union law. However, the obligation to protect the foundational values of the EU does not know such limitation of policy area or legal competence. In this sense, the principle of conferral of powers does not apply to Art. 2 TEU.19 Values have a structural function beyond the defined areas of Union law (acquis) and reach into all spheres of autonomous Member States’ acts, including their constitutional law and international relations. Similarly, the broad reference of Art. 7 TEU to the values of Art. 2 TEU demonstrates that all public powers have to ensure compliance as a common legal responsibility that justifies the presumption of compatibility and legality of the Member States’ measures and is the basis for mutual trust amongst Member States in accordance with the principle of sincere cooperation (Art. 4(3) TEU). The EU and all of its Member States have an interest in a minimum level of efficient protection of its core values (as expressed in the ECHR) in Art. 3 and 8 Statute of the Council of Europe, as well as for Union law in Art. 2, 7 and 49 TEU, being the conditions for membership in the CoE and the EU respectively. On a political level, commonality obliges the Member States to articulate and promote the Art. 2 TEU values internally and externally. While the Art. 2 TEU values are common to the Member States, the EU draws from those common values for its own constitution. They build the core and foundational basis that is set for the EU as its “aim” (Art. 3 TEU). Thus the values have the potential and the authority to build the normative foundation for a constitutional narrative, as a premise to the Union legal system, an unchallenged ground on which a discussion of rule-making considering societal and political options can take place. Chronologically, the founding value and primordial plot of the Community narrative is the common market. Some other values are not mentioned in Art. 2 sent. 1 TEU, that are, however, of significance for the EU, like peace and the well-being of the peoples of the EU, which Art. 3 refers to as the aim of the EU. More values appear in other provisions of primary law.20 The values stand next to each other without an a priori subordination or differentiation. Nevertheless, three areas of values appear to have an overarching significance without claiming that other values are necessarily and completely comprised in these three: the rule of law, democracy and fundamental rights. Where the process of constitutionalisation is perceived as the continued acknowledgement of legal structures that are fundamental in the sense that they build the basic premises on which a legal system is posited, then it finds itself not in need of a finalité other than the mere requirement that it is oriented towards its core values.23 A value-based constitution is value- and purpose-oriented, rather than finalité-oriented. Admittedly, Art. 3 TEU does not provide an answer to the question of a final shape of the EU institutional or constitutional order. But it points to the aims of the EU that are defined as to “promote the values” of the EU. An effective promotion of values as a constitutional narrative requires knowledge about content and relationship of values amongst each other. Amongst the ‘trinity’ (democracy, rule of law and fundamental rights), the rule of law is attributed a pre-eminent systematical position. Dependent on the legal and political perspective, either of the values of Art. 2 TEU may deserve a predominant position, both in design and enforcement. The eminence of the rule of law in the discussion on enforcement of values against Member States is also due to the fact that the Commission cannot reasonably take the position of guardian of democracy against EU Member States, despite the formal obligation endowed to it in Art. 17(1) TEU to ensure (without formal restriction) “the application of the Treaties”. Where the Fundamental Rights Agency27 comes forward with a proposal for measuring compliance with the shared values of Art. 2 TEU, it naturally attempts to gather the values rule of law and democracy under the overarching value of fundamental rights. In any of the constellations, a revolving question is in how far the values, or the principles derived from them, may be used against Member States. The EU legal order opts for a representative democracy (Art. 10(1) TEU) with its aspects of citizens’ participation (Art. 10(3) TEU). It addresses primordially the functions of responsibilisation, control and accountability in the exercise of public power in the EU and its Member States. Thus it builds the ground for the enjoyment of other rights, particularly fundamental rights28 and legitimacy for the application of the law. The respect for the other two values, human rights and rule of law, is in this sense best enabled in a participatory, democratic environment. Albeit democratic legitimation will continue to be derived primarily from the Member States,29 an ‘illiberal democracy’ appears not to be compliant with this enabling concept. Where the judiciary draws its legitimacy from elected parliaments or governments, any tampering of the executive with the independence of courts also indirectly affects the democratic legitimacy of the judiciary. The value democracy in CJEU case law30 rather appears in its shape as principle of democracy, and only since recently as an operational term with normative content.31 While the EU integration process was mostly driven by economic factors, democracy is not a principle that has been attributed much attention in the construction of the EU,32 or, as Weiler puts it: democracy was simply “not part of the DNA”33 of the European integration project. In line with the ongoing debate, this paper concentrates on the value contained in the rule of law principle, although it should be borne in mind that the other values deserve attention as to their place in the Union constitutional setting. There is no single, determined concept of democracy for Member States and EU available that serves as a sort of “standard”. An important premise on democracy however shall be retained in relation to the other values: The will of the people (may it be understood as domestic/national or European) cannot override the checks and balances neither other constitutional foundations of Union law. This confirms not only the autonomy of the EU legal order vis-à-vis an international agreement (here the Charter of the UN), but also makes clear that fundamental rights have to be seen in the light of the rule of law and the rule of law in connection with fundamental rights. This seems very obvious where a formal concept of the rule of law is contemplated: the mere guarantee of application of the law (legality) might not suffice where its substance is not compliant with fundamental rights. A similar judgment has been rendered with UPA35 on effective judicial protection of the rights derived from the EU legal order.36 The rule of law where it encompasses aspects of formal and substantive legal protection37 has to be interpreted in connection with the respect of fundamental rights, it embraces effective control and realisation of fundamental rights. The judgment of the Grand Chamber in Associação Sindical sends a signal beyond the case itself when stating that the principle of judicial independence may be relied upon against Member States in the fields covered by EU law, irrespective of whether the national measure actually implements EU law. The reason given for this scope is that the existence of effective judicial review is “of the essence of the rule of law”.38 Thus, under existing case law, there is space for applying the rule of law as a Union law concept against Member States. It is further of importance that the CJEU refers directly to Art. 19(1) TEU as the principle of effective judicial protection of individuals’ rights, giving concrete expression to the value of the rule of law. The term human rights in Art. 2 TEU has a broad meaning. The traditional differentiation is that human rights are protected by norms of international legal order (public international law), whereas fundamental rights are protected by national constitutions. In light of the autonomy of the EU legal order and its sui generis character of an organisation that protects fundamental rights internally and externally, a sharp separation is not indicated here. The scope of application of the Charter itself is limited to EU institutions and member states “when they are implementing Union law”, Art. 51(1) Charter. As a consequence of this narrow application, there is a lack of fundamental rights enforcement as far as compliance by Member States is concerned. This limitation has been subject to criticism where Member States as addressees of fundamental rights do not fulfil their obligations towards their own citizens, but cannot be forced to do so due to the missing scope of application of these rights under the Charter. The interpretation of clauses limiting the Charter application is of significance for the autonomy and sovereignty of the Member States. Any narrowing of Art. 51 Charter entails a broader application of the Charter to national measures and has to stand the test of the principle of conferral of powers. On the other side, a broader application may lead to a reduced constitutional diversity and has to stand the test of protection of national identities under Art. 4(2) TEU. These dynamics show that values, being common instruments of the EU and its Member States, have to be designed consistently within the EU legal order. This aspect shall be further contemplated in the next section. It is claimed that the concepts that maintain a balance between unity and diversity in the Union legal order are on the one hand all those principles that open the constitution sui generis into the sphere of Member States and which drive the EU integration process, namely: commonality of values, effet utile, supremacy and direct effect and, on the other hand, those principles that restrain the transfer of sovereignty to the Union: conferral of powers (Art. 5(2) TEU) and protection of national identity (Art. 4(2) TEU). The Melloni case law points in the same direction when ruling on Art. 53 Charter: In view of the various fundamental rights standards applicable in parallel, Art. 53 provides basically that the Charter shall not be interpreted as restricting or adversely affecting human rights standards. The CJEU interpreted this provision as meaning that when a Member State implements EU law, the national standard must not compromise the level of protection afforded by the Charter, neither the “primacy, unity and effectiveness of EU law”.44 Any higher level of protection afforded by national law is admissible. The CJEU does not interfere in the domestic legal order in relation to the level of protection, but instead emphasizes the overarching constitutional principles of primacy, unity and effectiveness of Union law in the sphere of fundamental rights application. If these principles are used to counterbalance domestic solutions by an EU-integrative concept, this could be applied also in the other areas that require counterbalancing between domestic and Union law, including in the area of the principles enshrined under the rule of law. Primary law indicates three paramount principles that regulate the relationship amongst Member States themselves and between the Union and its Member States: the autonomy of the EU legal order, the principle of supremacy (or primacy) of Union law over national law of the Member States and the principle of direct effect of Union law, such as developed by the CJEU in its seminal judgments Van Gend & Loos45 in 1963 and Costa/ENEL46 in 1964. These three principles that were found to institutionally and normatively empower the Union are balanced by those founding principles that shall on the other hand guarantee the domestic legal order of the Member States: the conferral of powers in Art. 5(2) and Art. 4(1) TEU and the principle protecting national identities, Art. 4(2) TEU.47Autonomy as developed by this case law does not imply a hierarchical relationship between Union legal order and nation-state order, but is—such as the principle of direct effect—intended to give suitable effect to norms set up on the Union level (effet utile). The legal orders stand next to each other and entertain a pluralist relationship, in which none of the constitutions can claim the ultimate authority. Similarly, supremacy of EU law relates only to the application of norms, not to their existence or validity. Therefore, where legal orders—although autonomous—are not independent from each other, their relationship can be addressed as “embedded autonomy”, with a functional “co-responsibility” of national and European courts.48 Their relationship is characterised by mutual respect (Art. 4(3) TEU), as well as continuous dialogue and openness (“permeability”49). The process of European constitutional integration has been marked profoundly by two historical events: by the failed Treaty Establishing a Constitution for Europe in 2005 and by the accession of Eastern European countries to the EU in 2004, 2007 and 2013. These two developments contributed to the avoidance of a more homogeneous constitutional setting, despite the facts that the substantial elements contained in the proposal for the constitutional treaty that was not adopted had been recycled and set in place by the treaty of Lisbon, and that any accession of new member states was conditional upon fulfilment of the Copenhagen criteria. The persistent risk of pleading for more homogeneity in the present EU constitutional landscape is the perception of a centralistic enforcement of values upon the existing constitutional traditions of Member States. The enforcement of values amongst Member states as “Herren der Verträge” seems to run on the edge of the Union’s competences and points towards a structural inability50 of the EU to defend its founding values. In this context, it is important to place the values of Art. 2 TEU against the common traditions of the Union as “Rechtsgemeinschaft” and of the successful guidance of the integration process by the means of law. The claim of a Union of values is not incompatible with the principle of conferral of powers. In fact, values do not need to be conferred upon the Union as if they were competences or prerogatives owned by Member States. Values rather circumscribe the common heart of national constitutions which continue to exist in widely accepted pluralism. For the same reason, the Art. 7 TEU procedure is correctly not limited to the competences conferred upon the EU (acquis), but can embrace any field of law, also in CFSP. The demand for homogeneity does not explain yet what exactly shall be congruent or homogeneous. Bearing in mind that the scope of a state’s obligation derived from e.g. rule of law principles is much wider than what is legally defined in the acquis, even full transposition of EU legislation into national law will not guarantee for full and irreversible adherence of that Member State to EU values.51 For the purpose of the present paper, it shall be retained that EU integration has reached a point of constitutional pluralism. The discourse about adjunctive constitutional identities—the one of the EU nation states and the European identity—is dominated by two strands of constitutional pluralism: a substantive pluralism and an epistemic pluralism. Substantive pluralism52 is represented by Weiler as a concept of constitutional pluralism in which several different substantive values are entrenched at the meta-level, which form a coherent whole and are inseparably bound together with the values of respect and autonomy in a substantive meaning of the terms. The understanding of values underlying this concept is that they form a cluster of externally valid and mutually dependent values. Epistemic pluralism on the other hand is represented by Walker and contends that it is only the mere procedurally defined reciprocity that is entrenched as externally valid at the meta-constitutional level.53 In line with this thinking, reciprocity is the “single externally valid priority Eigenvalue”, and apart from the values of respect and autonomy all other values are relegated to a lower rank of constitutional priority. The risk of a monist constitutional integration strategy, as Weiler maintains, is that it has the potential to strip the identity of the “the other”. It would wipe away also those boundaries of statal monism that are perceived as noble and at the same time entails the risk of transferring negative aspects of monist constitutionalism into the EU sphere. Weiler’s noble dimensions in nationhood are belongingness and originality, whereas the abuse of the nationhood boundaries could be exemplified by a development in which a sense of collective identity within a given state is turned into self-superiority against “the other”. In strict monistic terms, law and power rest in the ultimate source of authority, typically addressed as ‘sovereign’ in European constitutional history. The ambition to control the excesses of nation-state monism was the birth-narrative for the European Communities to exist and persists in the “Jean Monnet model” (the ‘bicycle theory’ of continuous integration). The avoidance of abuse of ‘sovereignty’ of nation states was supposed to become sustainable by the creation of common institutions and procedures that ensure at least that state monism does not prevail in its negative aspects, although it does not yet provide the conclusive, positive design of a finalité. Much of the latter part will depend on the successful transposition of the noble aspects of nationhood, here assumed with Weiler as belongingness and originality, into the European constitutional level, while maintaining the conditions for protection of cultural differences, usually referred to as the diversity in the motto ‘United in Diversity’. Constitutional heterarchy shall reduce the potential for sovereignty-abuse and prepare the ground for coexistent and substantively determined sources of authority.56 It is suggested to advance from focussing too much on the term ‘sovereignty’ and look out for EU-law concepts of balancing powers. If national identity under Art. 4(2) TEU really had the function to preserve the Member States’ “sovereignty” within the integration process and in order to counterbalance the integrative powers such as supremacy and direct effect, then the definition of the term would be surprisingly thin. It rather appears as a mechanism to protect diversity represented in the structures of the Member States: stating the equality of Member States (an aspect of pluralism), the respect for their national identities, fundamental structures, political and constitutional, for essential State functions, for ensuring the territorial integrity of the State, for maintaining law and order and safeguarding national security. The provision does not define a specific content of national identity. This list of goods, which basically addresses the protection of essential state structures and functions, at least clarifies that it cannot serve as an instrument to undermine the functionality of the EU on domestic side. In this sense, it is the Union’s functionality that preserves the legal order of the EU and sets the limits of interpretation of any reserve of national identity or any domestic restriction that may be derived from Art. 4(2) TEU. Timmermans argues that Art. 4(2) TEU is not codifying constitutional pluralism into primary law, but that it only “integrates the legitimacy claim of national constitutional core values into the EU legal system itself”57; in his view, Art. 4(2) TEU provides an absolute protection that excludes any balancing of a national identity against other interests. By contrast, where the CJEU has ruled on Art. 4(2) TEU, it did not use the provision as an absolute reserve of national sovereignty, but rather as an additional interest of a Member State which has to be taken into consideration when balancing various interests (thus in a relative meaning).58 Similarly, Konstadinides59 refers to case Sayn-Wittgenstein to maintain that, when balancing interests, national identity does not enjoy a higher status than public policy interests and that a rigid proportionality assessment against other legal interests relevant for the advancement of integration needs to be applied. He concludes that national identity should be broadly construed, in conformity with the traditional democratic values underpinned in Art. 2 TEU. Rule of law principles are perceived as being values common to the Union and all its Member States, extending to the exercise of all public powers. No constitution takes precedence over the other, the commonality of foundational values only demands to maintain homogeneity that justifies mutual trust. Ensuring value homogeneity throughout the Union protects the legitimacy of the EU as a whole, not only in the Member State that is concerned by a rule of law crisis. This perception would be the theoretical basis to do away with the popular narrative that when protecting common values the EU interferes with purely internal matters of a Member State and does so by infringing the principle of democracy. Admittedly, the enforcement process still is formally addressed against one or more Member States, thus the criticism of an undemocratic process may remain. On the other hand, once the initiative is taken by the Commission as guardian, the lack of democratic control is not increased by comparison to the legislative responsibilities entrusted to the institutions when acting strictly within the acquis-competences: the democratically legitimised Council or European Council would take decisions, with the involvement of the Parliament. The difference of ‘value enforcement’ per Art. 7 TEU is thus not lying in the level of legitimacy, but in the branch of governance which is dealing with enforcement: instead of a judicial decision taken by the CJEU, it is the Council to determine a sanction under the Art. 7 TEU procedure, acting as a political-executive body. Summing up as an interim result, EU values as constitutional ideals have the double nature of being derived from the Member States and nurturing their constitutions. The adherence to the values, apart from the acceptance of the acquis in toto, is an expression of homogeneity that is expected not only from countries wishing to accede to the EU (Art. 49 TEU), but is a persistent pre-condition for an EU membership and for the EU itself. In this context of shared sovereignty, the idea of simultaneously retaining full national sovereignty is not legitimate. Constitutional pluralism is confined to acknowledge that parallel legitimate legal orders exist, but cannot help in determining a sufficient level of homogeneity nor even on the content of values of Art. 2 TEU. As to the application of counter-balancing concepts, it is important not to use national identity for undermining the application of the law. Mutual trust in the Union-law conform constitutionality of other Member States is a basic presumption in a pluralistic heterarchy, yet it must not be used to turn the autonomy of EU law against the effective application of the law.69 In order to derive more concrete and justiciable principles rooting in the values, the method of comparative analysis can be fruitful and would facilitate enforcement. The various attempts to design and enforce principles specifically relating to the rule of law shall be analysed in the next chapter. The exercise of public powers by the Member States must not result in a violation of EU law, including of the values enshrined in Art. 2 TEU. Value encroachment not only by candidate countries before their accession, but also by those states that have already acceded the Union has become very real over recent years. Such violations involve normative infringement of the acquis at their margins, but at their core they are of constitutional nature and are capable of affecting the legal foundations of the entire Union. The vivid scientific debate accompanying the ongoing rule of law crises addresses design and enforcement of the rule of law. Both areas are intrinsically connected, because the normative content of any principle first needs to be defined in order to be enforced, while the expected degree of enforcement can influence the content of the value (“thin or thick”). The latter effect seems paradoxical in the realm of norms, while it is normal when defining values in the framework of political instruments and in a setting of constitutional pluralism. This chapter shall contemplate attempts to determine the content of the rule of law, the indicators developed and assess means to enforce the rule of law. The Commission compiled a list of some basic principles of the rule of law as derived from CJEU case law and attached them as Annex to its 2014 Rule of Law Framework74: legality, prohibition of arbitrariness, legal certainty, independent and impartial courts, effective judicial review including respect for fundamental rights, judicial protection, separation of powers, equality before the law. This suggests a broad definition and accepts that the precise content of the principles and standards stemming from the rule of law may vary at a national level. The Framework is based on the idea that an individual breach of the law can be addressed by the infringement procedure under Art. 258 TFEU also in cases relating to rule of law issues. These areas are however limited to scenarios in which the Member State breaches a specific provision of the acquis.75 The Framework explains that it shall serve as an instrument that is more quickly available than the Art. 7 procedure which also for its high thresholds is perceived as a mechanism “of last resort”. This approach was not only criticized by the Legal Service of the Council76 for not being within the competences of the Commission, but also in substance has to face some shortcomings: The specific legal content of rule of law principles is articulated and translated into objective or subjective rights. The rights derived from these principles may have an enforceable meaning developed in law and can therefore appear to be binding (hard) law, while the vagueness of values has appeared to be an invitation to argue that values are too open-ended and undetermined in order to be a workable measure for assessing governmental policies, actions and programmes. Blurred content with an emphasis on the political program rather than a legal instrument poses a risk. A value that is to serve as an operational yardstick requires certainty and must not be construed as a moving target. It would rather be a sign of the absence of the rule of law if it was enforceable with unclear content, because the rule of law demands the existence of legal certainty. Therefore, any catalogue of characteristics of the rule of law has to remain a catalogue of minimum standards. This is because securing fundamental values common to the Member States would embrace in principle any aspect of national law in any branch of government and state functions, not only against specific infringements of EU law by conferral, as per Art. 258 TFEU. A “democracy-proof” value of rule of law that can be enforced against Member States has to be limited to the core of fundamental constitutional principles, which will be enforceable as long as their content is precise enough. As a methodological criticism, the principles presented in the Commission Framework are derived exclusively from CJEU case law relating to the conduct of EU institutions in competition cases, without taking into account the legal systems of the Member States in relation to their understanding of the rule of law. Albeit when deciding on competition cases the CJEU has referred to the constitutional traditions common to the Member States, these traditions were operationalised only in the area of EU competition law. The Commission extends this concept into a horizontal application, whereas a mature rule of law concept should take into account also the (general) common constitutional traditions of Member States.77 Further, the rule of law concept collected by the Commission for its Framework focuses on judicial guarantees and standards of justice relating to procedural and judicial review, leaving aside the implications of the rule of law in other, non-judicial areas. On a systematical note, it is surprising that the Commission justifies its Framework with the need for equality amongst Member States. It is certainly correct to demand that all Member States have to be treated equally and that any rule of law monitoring and enforcement should be applied in the same way. However the principle of equal treatment cannot serve as normative foundation for the rule of law or its enforcement. As has been outlined above,78 it is not the equal treatment principle, but the commonality of values and the need for homogeneity in light of constitutional pluralism that would properly serve as a normative basis for a consistency claim. Finally, it is important to note that, in its Framework, the Commission tacitly expressed a preference for the rule of law amongst the values of Art. 2 TEU. This is in line with the assessment of the linkage displayed above and the role played by the rule of law within the “trinity” of values. The rule of law thus appears as a basic methodological ground and embracing concept, acknowledging that the other values, mostly fundamental rights and democracy would not find their environment for realisation without a rule of law in place.79 Some practical pre-requisites for rule of law compliance monitoring shall be considered below. Despite the difficulties of determining the detailed content of the rule of law, any measurement, qualification and quantification of compliance with its principles require definition of indicators to serve as criteria for a follow-up of the normative and factual rule of law situation in a given country. Otherwise monitoring of legislative, legal or factual developments would remain a vague exercise without chance of fruitful dialogue or even operational enforcement, or rather lead to Potemkin-measures. Objective and consistent indicators to assess and measure the domestic situations in order to determine what constitutes a ‘clear risk of a serious breach’ and the ‘existence of a serious and persistent breach’ of the rule of law. Broad monitoring powers regarding the factual compliance in the Member States. Functional sources of valid, objective and reliable information about the rule of law situation. A dedicated catalogue of indicators for EU rule of law compliance monitoring does not yet exist. But there are examples of good practice on how to develop and apply indicators or an index.81 Several institutions have been working with indicators over long periods: the UN with indicators on the implementation of the Millenium Development Goals, the World Justice Program and the Worldwide Governance Indicators. Some of them focus on the empirical perception by those who are affected by a state’s public service functions. Factual evidence of the rule of law situation can be provided by the EU Commission, Parliamentary committees, national institutes, judicial councils, justice and human rights networks and other civil society institutions, the Council of Europe and the EU Fundamental Rights Agency.82 The UN High Commissioner for Human Rights has developed Human Rights Indicators83 (in the three categories: structural, process and outcome indicators), which may also be used in the area of rule of law monitoring.84 The Venice Commission has set up valuable criteria in its Checklist85 and keeps providing country assessments over longer periods. The disadvantage is however that there is no genuine institutional connection between the Venice Commission and the EU, its findings are non-obligatory, the resources are not provided by the EU and—similar to the Fundamental Rights Agency—in principle86 there is no right of initiative to supply opinions without being requested to do so. The EU when relying on the Venice Commission would have to make use of an external body to ensure compliance with its own foundational values. It has to be born in mind that the use of indicators as well as the collection of data could instigate a confrontation on the political level similar to the above described dispute about the legitimacy of interventions on the constitutional level. Also for this reason, it is important to avoid double standards when designing indicators and defining sources of factual evidence, may these be EU-internal vs. EU-external or Member States amongst each other and vs. the EU.87 To address this, Toggenburg/Grimheden88 plead for a bottom-up approach that would especially involve civil society in order to avoid alienation of the population in the course of an Art. 7 TEU procedure. This would indeed be helpful, because it can shift emphasis from a highly politicised peer dialogue of Member States’ governments to a more decentralised governance level, facilitating evidence-based decision-making in all areas related to the rule of law. The use of indicators may also have detrimental ramifications when resulting in a simple ranking of countries. 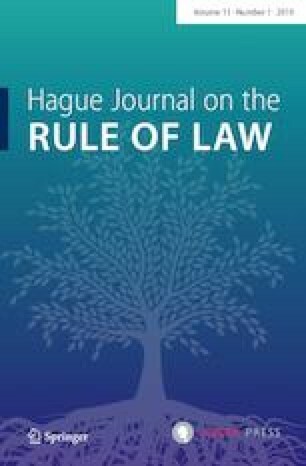 Critics point out that democracy and the rule of law are “fluid concepts and phenomena, and there is no single ideal formula to achieve them”.89 Instead of acknowledging the vagueness, indicators could create the impression that a “shopping list of elements” was enough to assess the rule of law situation. Regarding this criticism, it is correct that a ranking—a method e.g. used by the WJP rule of law index—only displays the country in comparison with other countries. A country may—despite materially worsening its rule of law situation—appear to improve in ranking, just because other countries have worsened harder.90 While it is certainly true that the design of standards along indicators can be attacked as “politically or ideologically biased”,91 the solution is not to be seen in abandoning benchmarking or indicators altogether. It rather points to the need to apply an elaborate system of indicators that takes into account the complexity of concepts and puts less emphasis on the ranking status vis-à-vis other countries. On the substantive question of what ‘systemic infringement’ means, it has been proposed that the qualifying difference between a specific violation of a legal obligation and systemic infringement of values is characterised by the intention of the Member State.95 However, this is hard to maintain in practice. Although it was possible to observe uncovered dismantling of independent justice institutions in Poland and Hungary (which at times were explicitly named to be of “illiberal” nature), it can be difficult to determine intent when examining measures undertaken by public authorities, beyond the reasons given e.g. in legislative materials or motivations of acts. Apart from that, the distinctive character of an intention is doubtful, because also specific violations of the law may be committed intentionally. As Scheppele96 remarked, ‘systemic infringement’ requires systemic compliance measures in order to remedy the situation. The institutions’ inability to check the systemic degree of compliance provides the ground for an application of Art. 258 TFEU that can overstretch its capacity when stalling technical violations in the context of systemic infringements. The CJEU has not decided on the notion of “systemic deficiencies” in rule of law matters, but used the term in cases N.S.97 and Kaveh Puid98 with regard to fundamental rights of asylum seekers, when acting within the scope of EU law. Without providing a definition the CJEU left it to the referring court to examine whether the deficiencies were systemic in nature. For the ECtHR, Rule 61 of the ECtHR RoP foresees pilot-judgment proceedings in cases of “structural or systemic problems”99 concerning the fundamental rights situation in a country. Although, the basic idea is comparable and may inspire a practice in EU law, the ECtHR concept stems from the human rights area and might not work out in rule of law infringements, given its low speed and the lack of remedies that could effectively avoid irreparable damage to a country’s population and constitution. The example of the damages done to the independence of the justice systems in Hungary and Poland shows that a financial compensation to the individual, illegally retired judge might be a measure to remedy an individual human rights violation, but is not an appropriate cure for a systemic rule of law infringement causing lasting deficiencies.100Von Bogdandy/Ioannidis and others have suggested defining the term ‘systemic’ as a situation in which “national law is generally perceived not to be any more capable of stabilising normative expectations of a significant number of social stakeholders”.101 This definition appears to effectively strike a central point of the deficits at stake, it is abstract enough to cover a broad range of pathological situations by applying the sociological benchmark of normative expectation. It remains however unclear how the missing ability to stabilise normative expectation can be practically measured: ‘systemic deficiencies’ is a pertinent category, but hard to operationalise. The legislative proposal refers to Art. 322(1)(a) TFEU which is the legal basis for financial rules governing the Union budget. It implements the demand103 to clearly link rule of law deficiencies with financial sanctions as one of the more promising means of enforcing rule of law principles.104 This and other main avenues of enforcement endeavours deserve further attention. Mechanisms to enforce value compliance of Member States have been widely discussed in literature105 over the last years. A general ground for the debate seems to be that values need to be upheld due to their universality and because of the negative impact of a violation on the application of substantive rights as a whole.106 What the enforcement tools have in common is that they are mostly107 of a reactive nature and are characterised by high substantial and procedural hurdles. They shall be discussed here selectively within the context of their systemic approach and practical efficiency. As one of the main proposals, Scheppele108 suggested a direct enforcement based on the concept of systemic deficiency by bundling up multiple single breaches of the rule of law and submitting the action against Member States to the CJEU, under Art. 2 TEU in connection with the duty of loyalty in Art. 4(3) TEU. This would apply in cases where a pattern of a Member State’s conduct amounts to a systemic violation of EU principles. The idea is to give a more flexible and sharp response instrument to the Commission vis-à-vis a backsliding Member State. In the area of the acquis, and in any case in line with the principle of conferral, the legal toolset for the enforcement of EU law against Member States in the fields discussed here is limited to the procedures under Art. 258 TFEU, i.e. the infringement procedure initiated (in practically all cases) by the Commission against the Member States that is perceived to be in default on the one hand side and, on the other side, the preliminary reference under Art. 267 TFEU from national courts to the CJEU. Both proceedings presuppose that an applicable EU norm is at dispute and that its interpretation is decisive for the outcome of the individual case. A first criticism of this enforcement has to do with the potential outcome: in accordance with Art. 260 TFEU the court will only state a breach of EU law—a result which is accepted to be sufficient in the context of acquis enforcement, but can scarcely serve to enforce values at large scale—despite financial sanctions that may be imposed upon the defaulting Member State. Infringement proceedings can be initiated only in cases of breach of a specific provision of EU law. The Commission is not empowered to take infringement action under Art. 258 TFEU against a matter falling outside the scope of EU law even if it poses a threat to the rule of law. All Europe-Agreements in preparation of the enlargement round of 2004 contained “human rights clauses” and provided the conditionality of the Copenhagen criteria. A specific tool that remains from the final phase of accession of Romania and Bulgaria (however not applied to Croatia) to the EU in 2007 is the Cooperation and Verification Mechanism (CVM). The CVM establishes benchmarks in the areas of judicial reform, integrity and anti-corruption measures, and is used for regular and formalised exchange. This mechanism could be extended to all Member States on an equal basis. The enforcement of values by sanctions is centrally located in Art. 7 TEU. The first phase of the enforcement mechanism in Art. 7(1) TEU requires a “clear risk of a serious breach of values” and then for the determination of Art. 7(2) the “existence of a serious and persistent breach” of these values. The procedural hurdles are high: on a reasoned proposal by one third of the Member States, by the European Parliament or by the European Commission, the Council, acting by a majority of four fifths of its members after obtaining the consent of the European Parliament for the first phase, and the “European Council, acting by unanimity on a proposal by one third of the Member States or by the Commission and after obtaining the consent of the European Parliament” for the second phase. In a third phase, deciding by a qualified majority on the sanctions themselves, the Council may suspend certain rights derived from the Treaties to the Member State in question, including the voting rights of the representative of the government of that Member State in the Council. In an attempt to make the procedure for addressing systemic threats to EU values more operational and to complement the Art. 7 TEU mechanisms, the Commission developed its already mentioned EU Rule of Law Framework in March 2014. The Framework shall be activated when “the authorities of a Member State are taking measures or tolerate situations which are likely to systematically and adversely affect the integrity, stability or the proper functioning of the institutions and the safeguard mechanism established at national level to secure the rule of law” (point 4.1. ), thus threats to the rule of law which are of a “systemic nature”. There are three procedural phases: a Commission assessment, a Commission recommendation and the follow-up to the recommendation. The Council presented its own, softer mechanism in December 2014, called “Dialogue among all Member States within the Council to promote and safeguard the rule of law”.112 The proposal of Council Dialogue is characterised by several limitations: the principle of conferral, the respect of national identities derived from Art. 4(2) TEU, and the adherence to the principle of sincere cooperation. This combination could lead to the unwanted situation in which the Council representatives cannot even have a dialogue about competences not conferred to the EU.113 There is no obligation to make the Council rule of law Dialogue public, thus both hindering public control and a potential naming and shaming. The lack of accountability and the format of yearly intergovernmental presentations risk being a sequence of monologues without the chance of effective improvement in the domestic legal orders. The eminent risk of applying a dialogue method only is that it can buy time for an illiberal government to destroy constitutional checks and balances. Further, it is still formally not clarified how the Commission’s Rule of Law Framework is to be seen in relation to the Dialogue of the Council. In practice, they co-exist next to one another. In April 2016, the European Parliament came up with a proposal for a Mechanism on democracy, the rule of law and fundamental rights.114 Its Annex contains a “draft Inter-institutional Agreement on arrangements concerning monitoring and follow up procedures on the situation of Democracy, the Rule of Law and Fundamental Rights in the Member States and EU institutions”. Art. 1 of the draft Agreement announces a “Union Pact” that shall provide for “the definition, elaboration, monitoring and enforcement” of values and principles and it attempts in its Art. 3 to incorporate the Commission’s Rule of Law Framework and the Council’s Rule of Law Dialogue into a “single Union instrument”. It acknowledges in its preamble that “elaborating definitions, standards and benchmarks regarding democracy, rule of law and fundamental rights is not one-off decision”, but a “permanent and interactive process”. A practical implementation of the Pact is not in sight. The approach taken by the Parliament sets aside exact legal definitions for making foundational values operational and embarks instead upon a process of dialogue and broad public debate. This method pins its hopes entirely on political instruments of value protection. The mentioned Commission proposal for a regulation115 of May 2018 with the purpose of linking ‘generalised deficiencies’ in regard to the rule of law with financial sanctions against a Member State, is innovative. Presented as a measure to legislate budgetary rules (Art. 322(1)(a) TFEU) it would require only the usual majorities within the ordinary legislative procedure, Art 294 TFEU, compared to unanimity in Art. 7(2) TEU. The logic applied for linking rule of law deficiencies with (amongst others) a suspension of payments and prohibition to enter new legal commitments116 is the following: ‘Generalised deficiencies’ affect the proper functioning of public authorities and effective judicial review. Both shall be guaranteed under Art. 19 TEU (as a concrete expression of Art. 2 TEU) that obliges the Member States to provide effective judicial protection, including when implementing the EU budget. As the preamble of the draft argues, the absence of effective judicial review in a Member State “can seriously harm the financial interests of the Union”. The concept functions by an irrefutable assumption that a Member State with generalised deficiencies is presumed to be unable to correctly handle EU funds. The attempt to enforce values by using financial means, such as suspension of payments in a country where effective judicial review is not ensured, has some plausibility. Yet the ultimate consequence of applying this logic is that a national incapacity to administer funds would not only lead to a suspension of payments but to a complete discontinuation of any shared budget implementation by the Member State that is deemed to be unable to correctly handle EU funds. It will have to be seen if the instrument will be adopted as such and how it will be applied. One might suppose117 that Art. 7 TEU is lex specialis to deal with the specific violation of EU-values, while Art. 258 TFEU serves the purpose of horizontal enforcement of EU law in general. This, however, is not correct. The relationship between Art. 258 TFEU and Art. 7 TEU is complementary. The orientation, function and consequences of the two procedures are different: while the infringement procedure refers to violation of specific norms in individual instances under the acquis, value enforcement tackles systemic deficiencies irrespective of the acquis. They have common areas where values are continuously being translated into norms, thus turning into the field of EU law that can be enforced under Art. 258 TFEU, with full judicial control by the CJEU. As good as this development is, it will never replace the political aspect of value enforcement and their sanctioning under Art. 7 TEU. So far, it is still not possible to assess the appropriateness of the Commission’s Rule of Law Framework as opposed to the Dialogue method put forward by the Council, nor to assess the effectiveness of the two Art. 7(1) TEU proceedings, initiated by the Commission against Poland in December 2017, and by the European Parliament against Hungary in September 2018. Nevertheless, some comparisons to similar proceedings can be drawn and the potential chances and risks be anticipated. It is claimed that the following overview on effectiveness confirms the political (rather than legal) nature of the enforcement proceedings. Already some years ago, the European Energy Community started to apply their enforcement mechanism under Art. 92 of the Treaty establishing the European Energy Community (TEEC). This mechanism shows some commonalities with Art. 7 TEU: it can be applied in a situation of “serious and persistent breach of obligations”; the sanctions state that voting rights may be suspended; the council of the Energy Community needs to decide on the breach unanimously; violating states categorically refuse to rectify the shortcomings. On the other hand, there are also quite some differences: the subject matter of violations are the specific legal obligations of member states under the TEEC and as stemming from individual legislative instruments118 established by the council, not – as required by Art. 7 TEU – the “values”; although preliminary warning mechanisms exist (Art. 90, 91 TEEC), there is only one single step in the procedure in order to conclude on the sanctions, not—as required by Art. 7 TEU—three phases; instead of a multitude of institutions that are involved in Art. 7 TEU procedure, only the Ministerial council is taking decisions; the system of the Energy Community does not possess any other infringement mechanism besides the warnings and sanctions foreseen in Art. 90–92 TEEC; the members of the Energy Community were not in a situation where they had to introduce compliant systems before being admitted to join the Community, thus there is no “Copenhagen Dilemma” for those who had not adjusted their legislation before and continue not to adjust them during membership. The example of the application of Art. 92-procedure in which not only suspension of voting rights, but also financial sanctions were applied against Bosnia-Hercegovina merits further analysis as to whether the combination of these sanctions had a measurable impact upon the compliance of the member state. As it can be inferred from the developments since the sanctions were adopted in September 2014, the combination of voting and financial sanctions had some repercussions, but remained altogether ineffective. The legal consequence under Art. 7 TEU is a discretional decision of the Council to “suspend certain of the rights deriving from the application of the Treaties to the Member State in question, including the voting rights” of the representative in the Council. First of all, it is important to note that this is a peer-judgment by a political body in an assessment of socio-legal-political nature, not by a judicial body in accordance with legal criteria alone. Even after reaching all required majorities, the Council may decide not to sanction. The remedies available to the sanctioned Member State are on the one hand again of political character and remedial proceedings at the CJEU on the other hand, limited to control of procedural aspects (Art. 269 TFEU). For several years, Art. 7 was an idle or at least a dormant clause. The way it was drafted makes it appear to be not only a last resort for various reasons, but even a measure that by its legal consequence (the country’s loss of vote in the Council) produces an undesirable consequence for all involved. It is clear that the loss of vote does not by and in itself solve problems related to the systemic threat or systemic deficiencies, but shall be perceived as a visible punishment.119 A more promising avenue of sanctions are financial in nature, like budget benefit cuts, mostly in the European structural and investment funds.120 Already in the past, economic conditionality was introduced to restrain Member States from accumulating excessive deficits while receiving EU-funds. After all, the Copenhagen criteria gained their persuasive power over acceding countries principally from the enormous difference between the financial status of a candidate country and that one of a full Member State. The decision-making requires high levels of political consensus (a majority of four fifths of the Council members for the first phase and unanimity in the European Council for the second phase). As per Art. 7(5) TEU and Art. 354 TFEU, the Member State concerned does not participate in the voting. By the letter, other Member States concerned by an Art. 7 TEU procedure against themselves do participate in voting and would be inclined to collude reciprocally with other Member States being in rule of law crises when casting their votes, thus exercising its veto in exchange for a veto of the other state. The legislator of Art. 354 TFEU has not foreseen a situation in which more than one EU country is in default. The situations of the second and further Member State is structurally comparable to the situation of the first state (at least in proceedings handled simultaneously). Therefore Art. 354 TFEU by analogy and in light of its effectiveness (effet utile) also applies in proceedings against several Member States permitted they are handled in parallel procedures. This sequencing or bundling of procedures is obviously a question of political opportunity. Art. 2 TEU values are fundamental European values and deserve continuous constitutional anchorage (“Ewigkeitsgarantie”), as well as compliance, promotion and enforcement. The pluralistic system of national constitutions that exists in parallel and embedded within the EU legal order will continue to require loyal cooperation, mutual trust and a reasonable degree of homogeneity with respect to its founding values. Values and the principles derived from them, such as freedom, democracy, rule of law and fundamental rights are shared and protected in parallel structures. The considerations above have shown that for legal reasons a value crisis affects the entire Union—not only one Member State—and therefore calls for answers on the Union level. Pluralism is not a carte blanche allowing for domestic rule of law deconstruction. The attractiveness of Art. 4(2) TEU with its relative protection of national identities is that it provides an intrinsic balancing element, i.e. within Union law itself. Important guidelines for a solution will further stem from the Melloni case law: to respect primacy, unity and effectiveness of Union law, despite the fact that in many areas of “value enforcement” the primacy principle runs idle, since the matter would be outside the acquis and the central question would not concern supremacy of one norm over the other. In a substantial pluralistic perception, it is not the EU that interferes in domestic matters, but a joint effort of upholding constitutional values that are common to all Member States in order to guarantee legitimacy and integrity of the Union as a whole. Value protection is, I have argued, a political concept with procedural-legal elements. It requires truly effective rule of law dialogues and institutions that act as facilitators and guardians of the treaties by prudently making use of the available enforcement instruments under Art. 7 TEU and Art. 258 TFEU. Dialogue, monitoring and enforcement are complementary measures of persistent, multidimensional efforts to up-hold the Union’s values. The method of comparative analysis can serve to further develop justiciable principles derived from values. They are to be found not only within the Union law acquis, but also in the constitutional traditions of the Member States. In order to make the values contained in Art. 2 TEU (most eminently the rule of law) justiciable under Art. 7 TEU, it will be necessary to establish objective, reliable and valid data, and to assess the facts on the basis of operational rule of law principles with discernable criteria. Provision of data could be achieved e.g. by the Commission, national institutes, judicial networks, the Venice Commission and the Fundamental Rights Agency. Even the idea of creating an “EU Rule of Law Commission”125 might be followed up, in order to retain this constitutional function inside the EU-institutional framework. In light of the political nature, the complexity and length of an enforcement procedure addressed against rule of law deficiencies, any sanctioning measure must be accompanied by prevention, dialogue and monitoring, such as a cooperation and verification mechanism (CVM) for all Member States. De lege ferenda, a more stringent codification particularly of the normative-operational content of rule of law principles is desirable, next to the financial sanctions mechanism based on the endangered capacity of a Member State in crisis to correctly handle EU-budget appropriations. However, the design and enforcement discussion leaves a central question unanswered: will the constitutionally required homogeneity of values in Member States indeed be enforced by sanctions? The political task of continuous exchange, enlightening argumentation, as well as open discussion of the actual rule of law situation on the basis of pre-defined and workable indicators remains an advisable effort. Yet a realistic assessment of the effectiveness of sanctions shall acknowledge that the value basis of the EU legal order springs to life by means that it cannot guarantee on its own. This humble self-restraint as regards the ‘power of enforcement’ seems to be a weakness on its surface, but is indeed an untold strength of the Union legal order and a sign of constitutional maturity. When considering that the scope of the Art. 7 TEU procedure is not restricted by the acquis, a question that remains open for further research is whether and how the same concept as discussed here for the enforcement of rule of law principles can also be applied in the area of fundamental rights protection and enforcement. This would entail that the EU could act outside the scope of the acquis in order to monitor, determine and sanction domestic fundamental rights infringements in Member States, thus against the literal limitation of competences to areas of EU law implementation under Art. 51 Charter.126 It would be enlightening to analyse this possibility within the context of the incremental fundamental rights jurisprudence of the CJEU. de Búrca (2010); Aust (2017). “Resolution of 12 September 2018 on a proposal calling on the Council to determine, pursuant to Article 7(1) of the Treaty on European Union, the existence of a clear risk of a serious breach by Hungary of the values on which the Union is founded” (2017/2131(INL), P8_TA(2018)0340. For an overview on the various legal concepts used to deflect criticism and justify rule of law dismantling, s. Kochenov and Bárd (2018); Halmai (2018) 23–42; Kelemen and Pech (2018). S. the detailed reasoning for the 7th Amendment to the Constitution of Hungary, Bill number T/332, unofficial translation. Alinea 1–3; similarly the preamble of the TEU: alinea 3 and 5. Former Art. F.1 TEU (Maastricht). Case 294/83 Les Verts ECLI:EU:C:1986:166, para. 23. A. von Bogdandy, ‘Constitutional Principles’, in Principles of European Constitutional Law (Hart, 2006) ed. A. von Bogdandy and J. Bast, 9. J. Ph. Terhechte, in Frankfurter Kommentar (Mohr, 2017), Art. 2 EUV, para. 3; Potacs (2016) 164 . J. Schwarze, in EU-Kommentar (Nomos, 2017), ed. J. Schwarze, Art. 2 TEU, para. 2. Nine out of 28 EU Member States do not even have a dedicated constitutional court. In line with the Venice Commission a broad concept applies: “the term ‘constitutional court’ refers not only to judicial bodies with the name ‘constitutional court’ but also to equivalent bodies of last instance which review constitutionality”, cf. CDL-INF(2001)9, 9; as is claimed in this paper with regard to the enforcement of values under Art. 7 TEU, also other institutions beyond the courts may play important roles in upholding constitutionality, such as here the Council and European Council; cf. for an analysis within the Member States: de Visser (2014) 11. A method that found some criticism, cf. Dzehtsiarou (2011). “wertende Rechtsvergleichung”, cf. AG K. Roemer, Case 63-69/72 Werhahn ECLI:EU:C.1973:95, ECR 1973, 1229, 1258. This seems to be also the opinion of the Commission when stating on Art. 7 TEU, cf. “Communication on Article 7 TEU. Respect for and promotion of the values on which the Union is based”, COM(2003) 606 final 5. E.g. social cohesion, diversity and solidarity (Art. 3(3) TEU), solidarity (Art. 2 sentence 2, Art. 3 TEU), integration (preamble, Art. 20(1) TEU) protection of national identities (Art. 4(2) TEU), subsidiarity (Art. 5 TEU, Art. 12 lit. b TEU, protocols no. 1 and 2). M. Bonelli, “From a Community of Law to a Union of Values” (2017) EuConst 1, 24. On the changing role of the objectives of the EU, s. Larik (2014) 935–962. Venice Commission, Rule of law Checklist, CDL-AD(2016)007, 9. Council of Europe (Parliamentary Assembly), Report of the Committee on Legal Affairs and Human Rights: The principle of the Rule of Law, Doc. 11343, 6 July 2007, para. 5. FRA Opinion 2/2016 of 8 April 2016, “on the development of an integrated tool of objective fundamental rights indicators able to measure compliance with the shared values listed in Article 2 TEU based on existing sources of information”, 7/8. Joined Cases C-402/05 P and 415/05 P Kadi and Al Barakaat ECLI:EU:C:2008:461, para. 316. Case C-50/00 P Unión de Pequeños Agricultores ECLI:EU:C:2002:462, para. 39. “(…) a community based on the rule of law in which its institutions are subject to judicial review of the compatibility of their acts with the Treaty and with the general principles of law which include fundamental rights”, Case C-50/00 P, para. 38. L. Pech, op. cit. fn. 26, 369. Case C-64/16 Associação Sindical dos Juízes Portugueses ECLI:EU:C:2018:117, paras. 35–37, 43–44; confirmed in Case C-216/18 PPU LM ECLI:EU:C:2018:586, paras. 49–54. Kruse (1954); Hummer (2015); Schorkopf (2000) 39; G. Toggenburg very early recognised the importance of homogeneity-control of values: “The Debate on European Values and the Case of Cultural Diversity“, EDAP 1/2004, 11. BVerfG, 2 BvR 197/83, BVerfGE 73, 339 387. W. Hummer, op. cit. fn. 39, 73. C. Closa, ‘Reinforcing EU Monitoring of the Rule of Law’ in C. Closa/D. Kochenov, op. cit. fn. 32, 19. Cf. J.-Ph. Terhechte, in Frankfurter Kommentar, ed. M. Pechstein et al. (Mohr, 2017), Art. 2 EUV, para. 3. Case C-399/11 Melloni ECLI:EU:C:2013:107, para. 60; Lenaerts (2018), 6–7. Case 26/62 Van Gend en Loos ECLI:EU:C:1963:1. Case 6/64 Flaminio Costa ECLI:EU:C:1964:66. These principles have thus been identified by the German BVerfG as core constitutional basis of the EU legal system, cf. BVerfGE 123, 267 (2 BvR 2/08). Pernice (2013) 55 [60, 63]. Wendel (2011) 5; Zemánek (2017) 214. On this distinction: Jaklic (2014) 69 et seq. ; Weiler (1999) 91 et seq. K. Jaklic, op. cit. fn. 52, 73. Ibid., p. 71; J. Weiler, op. cit. fn. 52, 91–92. K. Jaklic op. cit. fn. 52, 91. Cf. Case C-208/09 Sayn-Wittgenstein ECLI:EU:C:2010:806, para. 92; C-391/09 Runevič-Vardyn ECLI:EU:C:2011:291, paras. 86–91; also favouring a relative protection of national identity in the sense of a balancing exercise: von Bogdandy and Schill (2010) 706, 725. European Parliament resolution of 3 July 2013 on the situation of fundamental rights: standards and practices in Hungary, OJEU (2016) C 75/09, recital K.
CJEU, Opinion 2/13 of 18 December 2014, ECLI:EU:C:2014:2454, para. 167, confirmed in Case C-284/16 Achmea ECLI:EU:C:2018:158, para. 33–36. Joined Cases C-404/15 and C-659/15 PPU Aranyosi and Căldăraru ECLI:EU:C:2016:198, para. 88. Irish High Court The Minister for Justice and Equality v Celmer (No. 1)  IEHC 119, 12 March 2018. Case C-216/18 PPU LM ECLI:EU:C:2018:586, para. 69. P. Bárd/W. van Ballegooij, “Judicial independence as a precondition for mutual trust? The CJEU in Minister for Justice and Equality v. LM” (2018) New Journal of European Criminal Law, https://doi.org/10.1177/2032284418801569; accessed 2 November 2018. Mutual trust is not equivalent to mutual adherence: Kochenov (2016), 291 [293, 301]. Fallon (1997); D. Kochenov ‘The missing EU Rule of Law?’ in C. Closa/D. Kochenov, op. cit. fn. 32, 304; Tamanaha (2010) 215. Joined Cases C-402/05 P and 415/05 P Kadi and Al Barakaat ECLI:EU:C:2008:461, paras. 281, 303. L. Pech, “The Rule of Law as a Constitutional Principle in the European Union”, Jean-Monnet WP 04/09, 28. COM(2014) 158 final, 19 March 2014, 4. CJEU, Cases C-87/12 Kreshnik Ymeraga ECLI:EU:C:2013:291, para. 40; C-370/12 Pringle ECLI:EU:C:2012:756, para. 179; C-617/10 Åkerberg Fransson ECLI:EU:C:2013:105, para. 17. Council Legal Service, “Commission’s Communication on a new EU Framework to strengthen the rule of law—compatibility with the Treaties” of 27 May 2014, 10296/14. Also EU law itself knows other principles of the rule of law, like loyalty (Art. 4(3) TEU), limitation of retroactivity, consistency/coherence, legitimate expectations, proportionality. On the positive aspects of the CVM, s. M. Vachudova, ‘Why Improve EU Oversight of Rule of Law?’, in C. Closa/D. Kochenov, op. cit. fn. 32, 280–283. Cf. FRA Opinion 2/2016 of 8 April 2016 “On the development of an integrated tool of objective fundamental rights indicators able to measure compliance with the shared values listed in Article 2 TEU based on existing sources of information”. Human Rights Indicators: A Guide to Measurement and Implementation, UN Office of the High Commissioner for Human Rights, 2012. M. Scheinin, ‘The Potential of the EU Charter of Fundamental Rights for the Development of the Rule of Law’ in C. Closa/D. Kochenov, op. cit. fn. 32, 175. CDL-AD(2016)007; Opinion Nr. 904/2017 on the Polish draft acts relating to the National Council of the Judiciary, the Supreme court and the organization of the ordinary courts, CDL-AD(2017)031. Art. 3(2)(1) Statute (CDL(2002) 27, 27.2.2002): whereas research, studies and drafts may be carried out on the Venice Commission’s own initiative. On the EU as exporter of values in external cooperation: Pech (2016); L. Pech, op. cit. fn. 80. G. Toggenburg/J. Grimheden, ‘The rule of law and the role of fundamental rights’ in C. Closa/D. Kochenov, op. cit. fn. 32, 162. Bárd et al. (2016), iv. Taking the WJP Index as an example, Poland has “improved” from rank 27 in the 2014 report to 21 in the 2015 report and then worsened to 25 in the 2017/18 report, cf. WJP yearly reports: http://www.worldjusticeproject.org. P. Bárd et al., op. cit. fn. 89, iv. Ibid. ; the term was originally introduced by von Bogdandy and Ioannidis (2014b). See chapter A 1b and 3d above; Konstadinides (2017) 157. Cf. Hillion (2016) SIEPS 1, 9 and in ed. C. Closa/D. Kochenov, op. cit. fn. 32, 59 72. K. Scheppele, ‘Enforcing the Basic Principles of the EU Law through Systemic Infringement Actions’ in op. cit. fn. 32, 122. Joined cases C-411/10 and 493/10 N.S. ECLI:EU:C:2011:865, para. 94, 106. Case C-4/11 Germany v Kaveh Puid ECLI:EU:C:2013:740, para. 36.
cf. ECtHR Grand Chamber, judgment of 22 June 2004, Case Broniowski v Poland, Application no. 31443/96, para.189. D. Kochenov/L. Pech, op.cit. fn. 3, 1065.
von Bogdandy and Ioannidis (2014a), 301f; F. Schorkopf, op. cit. fn. 79, 156; A. von Bogdandy/M. Ioannidis, op. cit. fn. 93. Regulation “on the protection of the Union’s budget in case of generalised deficiencies as regards the rule of law in the Member States”, COM(2018) 324 final of 2 May 2018. Cf. Selih et al. (2017). A similar link would be the disapplication of Art. 267 TFEU for a Member State where widespread lack of independence of courts is established: preliminary references to the CJEU require court independence as one of the referral admissibility preconditions, cf. Case 14/86 Pretore di Salò ECLI:EU:C:1987:275, para. 7; Case 338/85 Pardini ECLI:EU:C:1988:195, para. 9. Eight main enforcement proposals are presented in D. Kochenov op. cit. fn. 32, ‘An EU mechanism’ (2016) 28 et seq. ; Pech and Scheppele (2017). The 2016 proposal of the European Parliament contains both prospective/preventive and reactive aspects, cf. PE576.988 of 5 April 2016, adopted on 26 October 2016 as P8_TA(2016)0409. K. Scheppele, ‘Enforcing the Basic Principles of the EU Law through Systemic Infringement Actions’ in op. cit. fn. 32, 105. Kochenov and Pech (2015), 520. Council document 17014/14 of 16 December 2014; critical on the Commission’s role as guardian: D. Kochenov/L. Pech, op. cit. fn. 3, 1062. C. Closa, ‘Reinforcing EU Monitoring of the Rule of Law’ in ed. C. Closa/D. Kochenov, op. cit. fn. 32, 33. PE576.988 of 5 April 2016, adopted on 26 October 2016 as P8_TA(2016)0409. COM(2018) 324 final of 2 May 2018 op. cit. fn. 102, s. above B 3. Art. 4(1)(a) of the draft regulation. Cf. the Commission’s Rule of Law Framework, op. cit. fn. 92, 5; Chr. Hillion (as here), op. cit. fn. 95, 8. A side-effect (not a sanction) of an initiated Art. 7 procedure is that an application for asylum of an EU citizen in another Member State (which in principle is inadmissible) may be declared admissible, cf. Protocol No. 24 TFEU ‘on asylum for nationals of member States of the European Union’, OJ  L 115/305. J. Selih et al., op. cit. fn. 103. Case C-619/18 R Commission/Poland ECLI:EU:2018:852. S. Resolution Res(2004)3 of the Committee of Ministers of 12 May 2004 “on Judgements Revealing an Underlying Systemic Problem”. EU law would have almost foreseen this option: Art. 44 of the draft treaty on the European Communities proposed by Spinelli in 1984 (which never entered into force) contained sanctions of exclusion of a member state. Art. 6 of the UN Charter contains the option to expel a member state “who has persistently violated the Principles contained in the present Charter” from the organisation. P. Bárd et al., op. cit. fn. 89, 116. A first step seems to be taken by AG Sharpston when proposing that EU fundamental rights should apply provided that the EU has competence, even if the competence has yet not been exercised, Case C-34/09 Ruiz Zambrano ECLI:EUC:2010:560, para. 163; for a plea of application of fundamental rights outside the scope of EU-law: A. Jakab, ‘The EU Charter of Fundamental Rights as the Most Promising Way of Enforcing the Rule of Law against Member States’ in C. Closa/D. Kochenov, op. cit. fn. 32, 194. Open access for this paper was provided by King’s College London. The paper is a modified version of a text presented as M.A. dissertation at KCL.